Le Groupe La Poste works daily towards useful, responsible and carefully selected digital technology, to give everyone simple access to new services making life easier, while maintaining data privacy and respecting everyone’s choices. Particular attention is paid to vulnerable persons unfamiliar with digital usage. 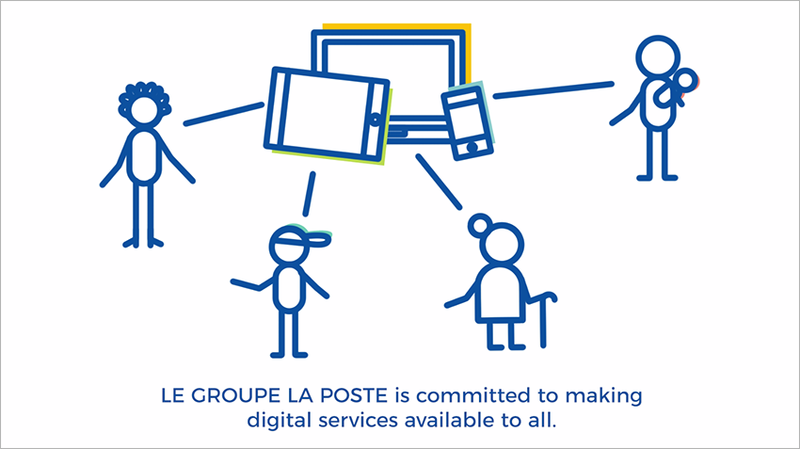 [VIDEO] Le Groupe La Poste is committed to making digital services available to everyone. We help our customers to embrace these new tools and we use technology as a driver for social inclusion. The internet has become absolutely vital to everyday life. In France, 85% of the population has an internet connection, and 74% report they use it every day. As smartphones and tablets become commonplace, the options for going online have now increased vastly. The net is used throughout daily life: to communicate, work, shop, complete administrative procedures, view and manage your bank account, and pay bills and taxes. A vast array of information and services is made available to people. This omnipresence of the Internet in French life has given birth to new challenges: data protection, transparency, mastery of digital tools, inclusion of seniors and vulnerable populations in the digital transition. This is why, as a leading public-sector business with a long-standing online presence in France, and as a trusted third party, we implement mechanisms and technologies for a useful, responsible and accessible digital world for all. Personal data is fuelling the digital revolution. The business model of some free services, such as search engines, is currently based on the exploitation and monetisation of users’ personal data. La Poste refuses to subscribe to this philosophy, and is committed to maintaining the confidentiality of data its customers provide. Anticipating the GDPR (General Data Protection Regulation), we have applied a Data Policy since 2016, the first data protection policy in France. This policy fully meets French people’s requirements in this area, obviously complies with the GDPR’s recommendations, and guarantees to users of the Group’s digital services that their personal data will be used responsibly. For more than a century, the oath sworn by employees has guaranteed the safeguarding of correspondence and money handled by La Poste. Since 2014, the oath has been extended to personal data held electronically. This is therefore not only a commitment by the business, but also a matter of honour for each and every member of staff. To provide entirely trustworthy access to digital services, we have developed a base of fully secure, free of charge, services for our customers, including the Digiposte+ application, which is a digital archive for the secure collection, sorting, filing and retention of users’ administrative documents, providing access to them wherever the user might be; and a digital identity verified by the postman and certified by France Connect, the leading portal for access to French administrative procedures online, confirming La Poste as a universal digital services operator. At the same time, we also carried out our own internal digital transformation. An “All digital” training course has been offered to give all employees in our various business units the necessary basic knowledge, and enable them to understand the challenges of digital technology.All employees need to be able to count digital technology in their skills set needed for their role. Like postmen, who now carry Factéo smartphones, digital devices making their work on their rounds easier and enabling them to offer new services to meet the needs of all French people. Employees wishing to gain in-depth digital expertise are also given training opportunities. For example, staff wishing to move into computer coding roles develop those new skills at the Simplon digital training provider before applying them within the Group. After a nine-month sandwich course, employees gain a level of technical expertise constituting a genuine asset for the Group. For La Poste, digital is a major transformative factor that is shaking up its historical activity and offering new opportunities. Attentive to vulnerable populations, we are also developing digital applications and services for senior citizens. We consequently offer the Ardoiz, the first tablet designed for older users, ergonomic and easy to use, with no keyboard and no mouse, delivered to its elderly recipients by the postman. In the 500 public service bureaux located in post offices, customers are able to use a publically-accessible space shielded from general view and provided with equipment (computer, internet connection, scanner and printer). Our customer service staff have been trained in digital knowledge transfer, and offer support and guidance to people using the bureaux for online procedures. The rise of the internet is a major transformation driver for La Poste, changing its business from traditional mail services and offering new opportunities. We have opted to view this as a powerful driver for the future, and as a resource of benefit to everyone, along with all the necessary trust guarantees. Galvanised by this deep-seated wish, Le Groupe La Poste is helping all French people, local authorities and businesses in this digital transformation.